Note: As-written, this is a 2-day affair, but the cardamom overwhelms the savoury to the point that you can’t really taste it anymore, so if you’re feeling impatient, you can skip the step of letting the nectarines and savoury sit overnight. Or you could try reducing the cardamom so the savoury isn’t overwhelmed! A big thanks to Nick for his help taste-testing along the way! 1. Prepare an icy water bowl or very clean sink with the juice of one lemon. Blanch whole nectarines in boiling water for one minute, just until the skins start to split. Dunk quickly in the icy water bath. 2. Peel, bit and slice peaches. 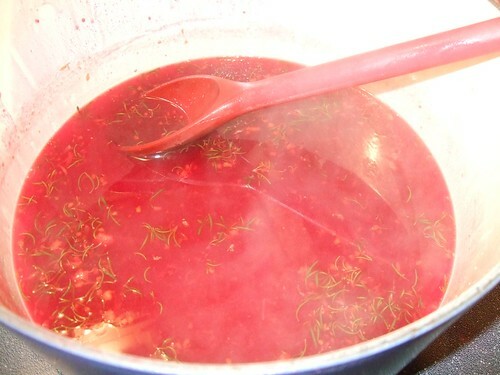 Place in a non-reactive preserving pan with sugar and juice of one lemon. Heat on low until sugar is melted. Turn up heat to medium-high and bring just to a simmer. 3. Place mixture in a large bowl, bury savory sprigs within. 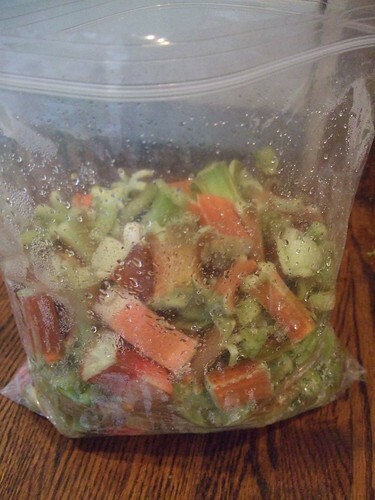 Let cool, then place in fridge or another cool place overnight. 1. Prepare your canning pot, lids, and jars. Put 2 small plates in the freezer for testing the set. 2. Separate fruit from syrup by either draining in a colander or using a slotted spoon (or both). Place syrup in preserving pan and bring to 221 degrees. Skim foam off top if needed. Add nectarine slices, remove the sprigs of savory as you are doing so. Add the cardamom to the pan 1/4 tsp at a time, stirring and tasting (carefully – it’s HOT!) until you like the strength. Add the cayenne pepper – add it in smaller amounts and taste as you go, if you wish. Bring to the boil again on high heat. Boil for 5 minutes. Note: At this point, the little bowl of foam I skimmed off the top of my cooked syrup was set into a perfect jelly, so I skipped testing the set. If you’re not sure, proceed to step #3. If you know you’ve got a good set, move on to step #4! 3. Test the set by first turning the heat off. 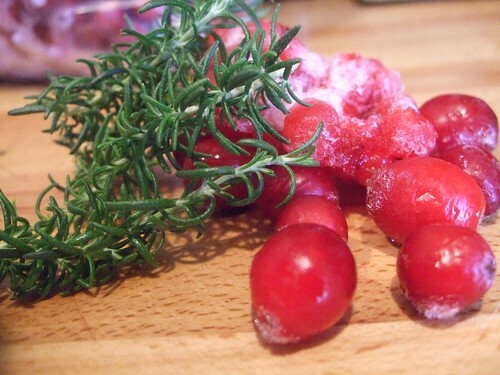 Place a teaspoon of the preserve on a frozen plate. Place plate back in freezer for 30 seconds or so. Run your finger across the plate and through the mixture. If it wrinkles, even slightly, it is sufficiently set. If your finger makes a clean break, place the pan back on high heat and boil for another minute. Try again. 4. 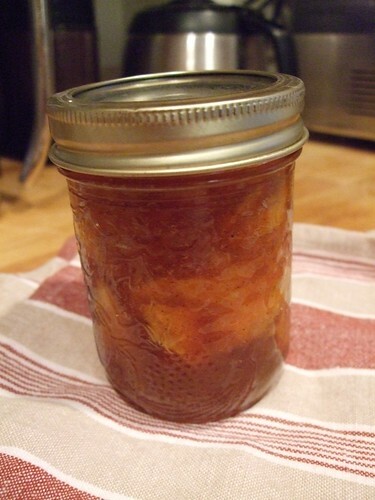 Remove hot jars from canner and ladle preserves into jars to within 1/2 inch (1cm) of top rim (headspace). Process 10 minutes. 5. Try not to eat it all at once. Throw it in the food processor, cook it up, and can it? Use lots of chillies and leave the seeds and you end up with what I call “Hotter than Hades Salsa”! I made this salsa during the winter, but the mid-winter tomatoes in Ontario are really awful, so the salsa ended up more heat and less flavour – spicy but bland. My husband still loved it though, so I promised him I’d make more during tomato season so he would get to experience what it should taste like. The leftover bit that I didn’t can was eaten up quickly last night, so I think he liked the results. Yield: 3 cups (750mL) – I almost quadrupled the recipe and got 14 1/2 cups. 1. 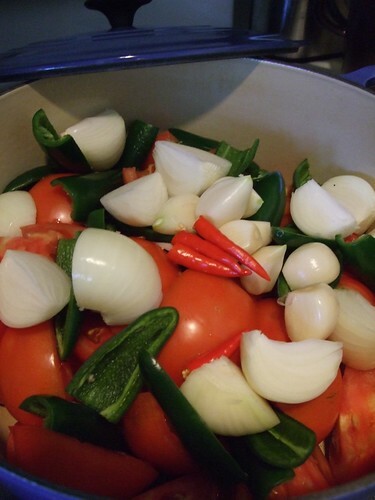 Combine tomatoes, onion, garlic, and peppers in a food processor or blender; process until smooth. Transfer to a medium stainless steel or enamel saucepan. 2. Add vinegar, oregano, salt, and sugar. Bring to a boil over high heat, reduce heat, and boil gently, uncovered, for about 15 minutes. or until the salsa is thickened (cook longer if you double or triple the recipe). 3. 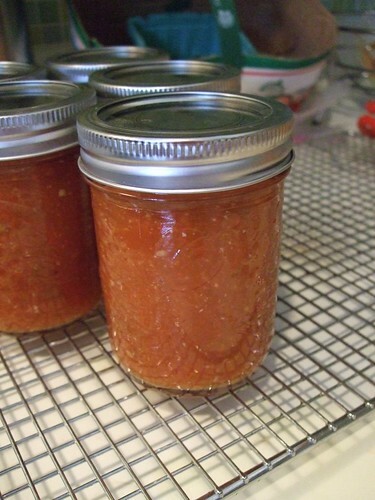 Remove hot jars from canner and ladle salsa into jars to within 1/2 inch (1cm) of top rim (headspace). Process 20 minutes for half-pint (250mL) or pint (500mL) jars. 1. Prepare canner, jars, and lids. 2. In a large stainless steel saucepan, over medium-high heat, combine sugar and water. Bring to a boil, stirring to dissolve sugar. Add cherries, stirring constantly, and return to a boil. Reduce heat and boil gently for 5 minutes. 3. 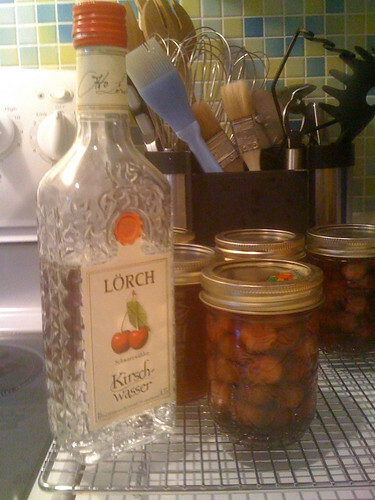 Using a slotted spoon, pack cherries into hot jars to within a generous 1/2 inch (1 cm) of top of jar and add the Kirsch. Ladle hot syrup into jar to cover cherries, leaving 1/2 inch (1 cm) headspace. Remove air bubbles and adjust headspace, if necessary, by adding hot syrup. Wipe rim. Center lid on jar. Screw band down until resistance is met, then increase to fingertip-tight. 4. Place jars in canner, ensuring they are completely covered with water. Bring to a boil and process for 10 minutes. Remove canner lid. 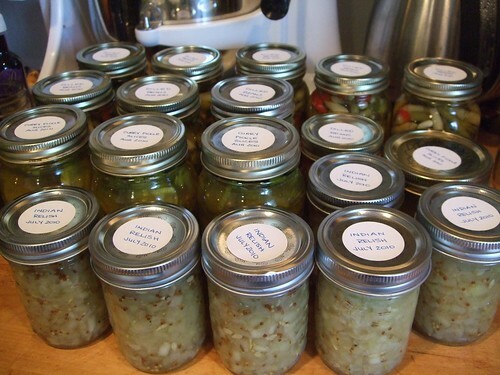 Wait 5 minutes, then remove jars, cool, and store. 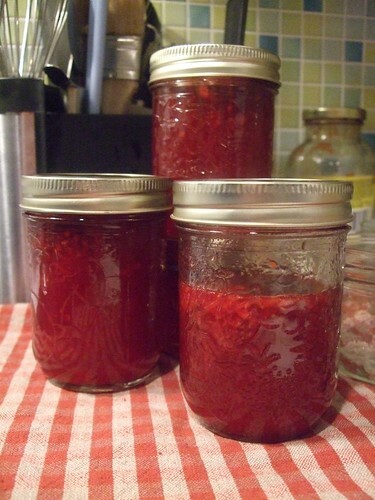 I had extra syrup at the end, so I did three more jars as above, but without the cherries. Yum! Earlier this month on the YGG boards, Heather and I guessed that this month’s Can Jam ingredient would be either asparagus (her guess) or rhubarb (my guess). Turns out we were both right! This month we had the choice between asparagus and rhubarb. 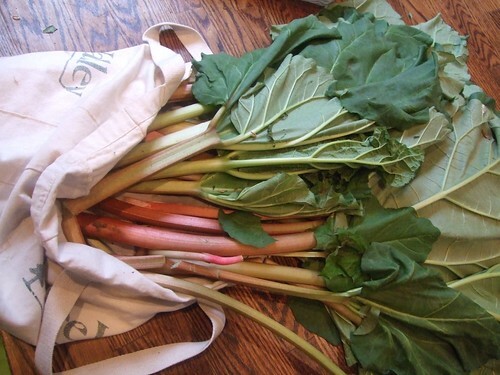 I picked rhubarb, hoping the plant in my back yard would give me some good (and very local!) yield for this month’s Can Jam! Unfortunately, the plant seems to have other plans and, unlike every other gargantuan rhubarb plant in Southern Ontario, it’s tiny. It’s barely big enough to harvest a single stalk. I promise it looked much better than this. The condensation was because it was in the fridge. The rhubarb was excellent and fresh! 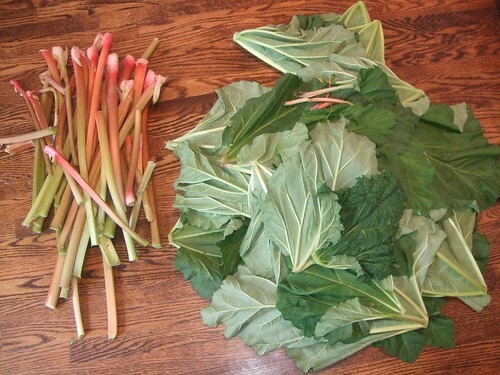 We left the leaves on so we didn’t leave a mess in the backyard, but I cut them off and threw them out – rhubarb leaves are poisonous, so don’t eat them!! With a small amount of rhubarb from my CSA, the stuff from my sister, and the Random Act of Rhubarb, I ended up with 30 cups of chopped rhubarb. That’s enough for stewed rhubarb, Victorian BBQ Sauce, and 7 cups that are now in the freezer waiting for strawberry season to start so I can make strawberry rhubarb pie filling! 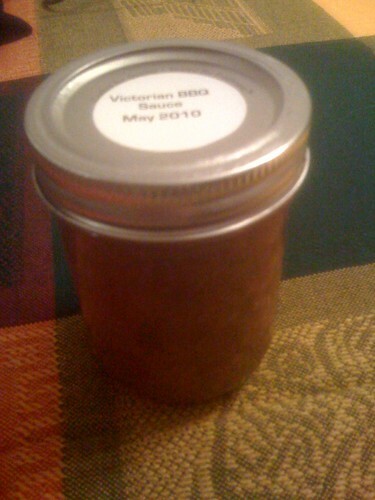 The most unique of the recipes is the Victorian BBQ Sauce, so that’s what I’ve chosen for this month’s Can Jam! 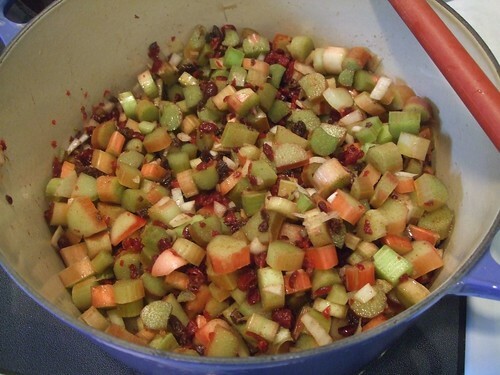 I may post about the stewed rhubarb later. The only change I made to the recipe was that I only had about 3/4 cup of raisins, so I substituted 3/4 cup sweetened dried cranberries instead of running to the store for more raisins! The only other suggestion I can come up with is this: Make a double batch. This is good stuff and you’re going to want lots. 2. In a large stainless steel saucepan, combine all ingredients. Bring to a boil over high heat, stirring frequently. Reduce heat and boil gently, stirring frequently, until mixture is thickened to the consistency of a thin commercial barbecue sauce, about 30 minutes. 3. Ladle hot sauce into hot jars, leaving 1/2 inch (1 cm) headspace. Remove air bubbles and adjust headspace, if necessary, but adding hot sauce. Wipe rim. Center lid on jar. Screw band down until resistance is met, then increase to fingertip-tight. I had an extra cup or so left over of the sauce so, instead of doing a half-jar, I used it on the pork tenderloin we ate for dinner that night. Just spread the sauce over the tenderloin, bake at 350F until the tenderloin is cooked. Easy! For bonus points, dump all the juices and extra sauce out of the roasting pan into a small saucepan. Put it over medium-high heat and bring to a gentle boil, stirring frequently (this stuff is really sweet, so it’ll stick easily!). Meanwhile, mix 1 tbsp flour with some water, stock, or some of the juices into a small bowl (I use a container with a lid so I can shake it all together) and mix as well as possible. Dump the flour mixture into the heated juices, mix with a whisk until well blended, and spoon this over the tenderloin. 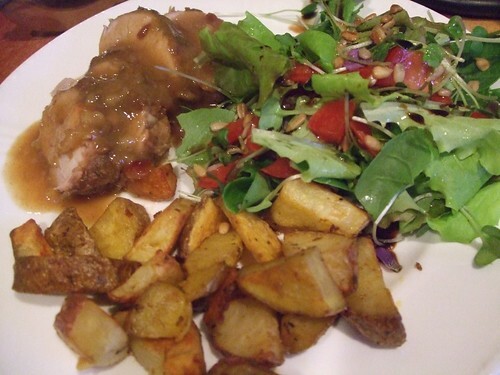 For extra noms, serve with oven roasted potatoes and a salad of fresh greens straight out of the garden. Yum. Happy Victoria Day weekend to all my Canadian friends! My mom has grown red currants for several years, but I never really understood the appeal. They’re tiny fruit that take forever to harvest and the bushes attract aphids like no other plant I know. And for some reason I had convinced myself that I didn’t even like the taste of the berries. Then, last year, I went raspberry picking with a friend of mine and the farm also had black currants, so we laboured for over an hour to get two baskets of the tiny berries. I brought them home and made black currant jam… and decided currants are my new favourite fruit. So I called my mom and asked her to set aside some of her red currants for me. Those precious berries sat in my freezer until I pulled them out to make this month’s Can Jam recipe. I won’t make the mistake of leaving them unused for that long again! After my great black currant jam experience, I thought I’d love to add a currant bush or two to my fruit collection, but figured they’d have to go in the ground and I’m pretty much out of room, so I didn’t obsess about it too much. Then one day, while Googling my way around the internet, I learned that currants will grow just fine in containers. So I started keeping my eye out for a black currant bush. 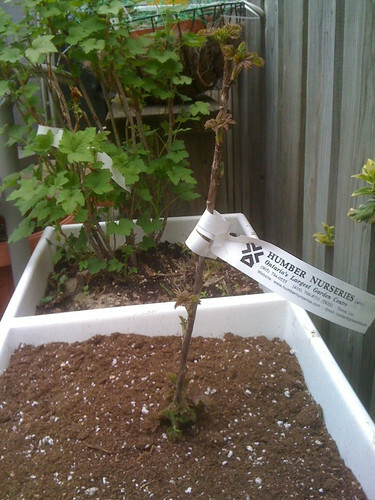 I ended up with a “Ben Conan” black currant that is happily growing on my deck in a big plastic container. Clusters of medium-large sweet green-white fruit. Currants grow on 1 and 2 year old wood. Three year old wood should be removed. Ripens late July. Plant in moist well drained soil. Full sun. So hopefully in July I’ll be canning up a whole rainbow of red, black, and white currant jams and sauces. Tigress’ Can Jam April Featured Produce: Herbs! 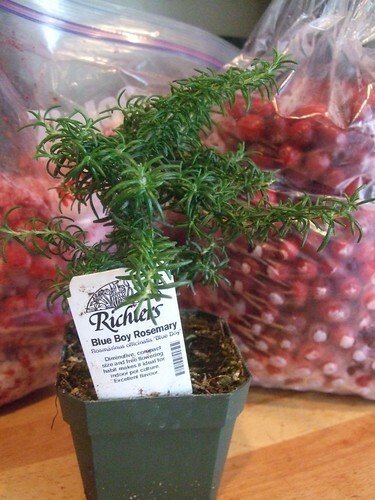 It’s a rosemary from the release party for Grow Great Grub by Gayla Trail. Which means this is the first month I’ve managed to actually use local produce as the featured ingredient – you can’t get much more local than what’s grown right in my own house! Then I went into my deep freeze and pulled out some cranberries and red currants. The red currants were grown by my mom in Bruce County. She always has way more currants than she can use and gave me a bag of berries that’s been in the freezer since last summer. The cranberries were picked up at a farm stand off highway 400 in the Orillia area and were grown not far north of there. That’s two more local ingredients! This recipe is loosely based on a Raspberry & Red Currant sauce in The Complete Book of Small-Batch Preserving by Ellie Topp and Margaret Howard. I went on a few tangents from there. There were a few little things I’d change for next time. For one, I’d cook and strain the currants on their own and then make the sauce from there with whole cranberries (they should be cooked just until they burst, like you would with cranberry sauce). I’d also add a bit more rosemary, although the rosemary may shine through more after the sauce has had a few more weeks to blend. 1. Combine red currants, cranberries, and water in a medium stainless steel or enamel saucepan. Bring to a boil over high heat, reduce heat and boil gently, covered, for 20 minutes. Strain mixture through a fine sieve or cloth (you may need to let it sit for a few hours to drip); discard pulp. 2. Return sauce to pan, add orange juice, and return to a boil. Slowly add sugar, stirring constantly until sugar is dissolved. Stir in orange zest and rosemary; boil gently for 5 minutes. One final thing: this sauce is delicious… but I have no idea what to use it on. It’s both sweet and tart, with a nice hint of citrus. The rosemary seems to complement the fruit very nicely. It’s quite runny but, judging from how it looked when I canned it up, it may thicken slightly as it cools. So… any ideas?